Construction worker Alex Guimaraes worked on ramps in Beacon Hill. 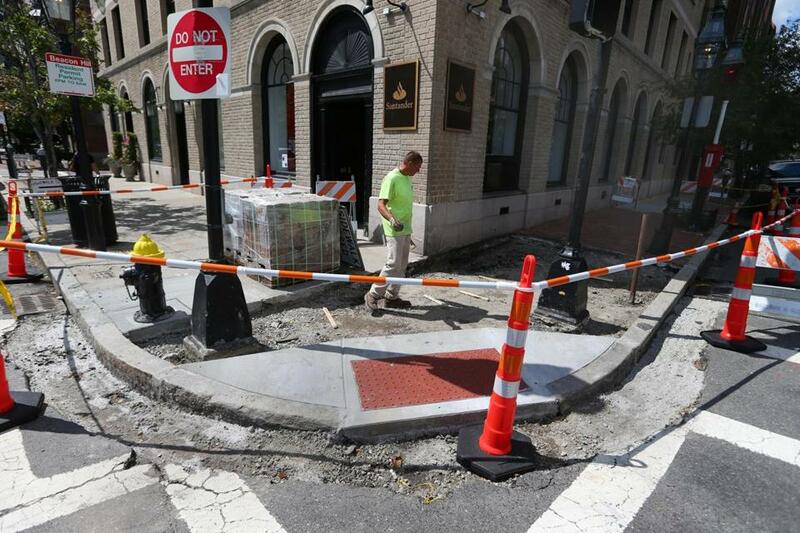 The idea of installing brightly colored curb ramps didn’t go over well in the Back Bay, Bay Village, South End, and Beacon Hill when city officials presented plans to help disabled pedestrians navigate the streets. Some called the proposed color of the ramps’ tactile warning strips “Big Bird” yellow. Others likened it to a school bus. But when the city offered a more pleasing alternative — brownish-orange color — everyone got on board. The neighborhood’s civic association says handicap ramps would mar the area’s historic character. 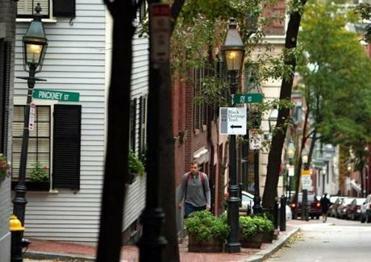 By continuing to oppose the ramps, the Beacon Hill group is at odds not only with other Boston neighborhoods, but also those in several other cities with vocal residents who sought to retain the charm of their communities and who found a way to compromise. The city is ignoring the Beacon Hill’s objections and has begun installing the ramps. Keeta Gilmore, chairwoman of the association, maintains the city’s plans are not appropriate for the historic neighborhood, and said city leaders have refused to entertain other ideas such as brick ramps, which she says are beter suited for the area. City officials say that other materials are too expensive to use widely. The neighborhood’s intersections are dangerous, they say, and should be upgraded immediately to comply with federal law. Similar disputes have played out across the country, with preservationists and disability advocates typically finding common ground. Last year in Columbus, Ohio, residents were upset when street crews removed historic sandstone curbs to install accessible ramps. 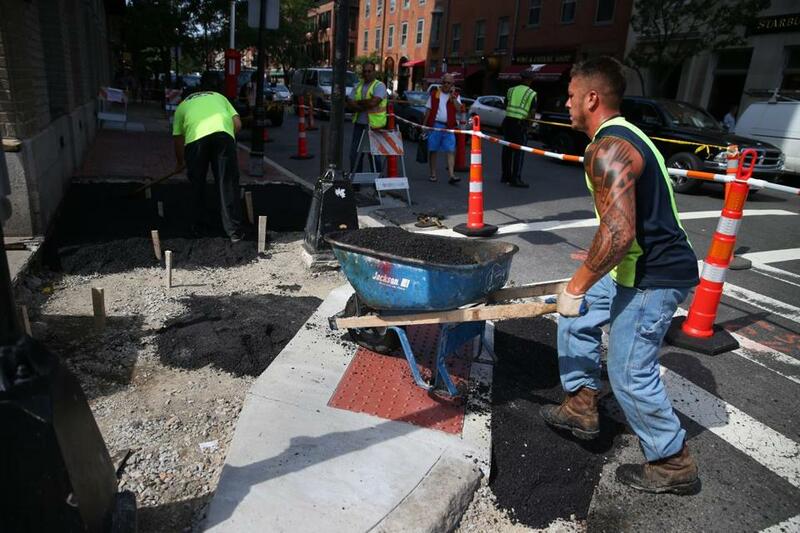 In Portland, Maine, city officials and preservationists have tangled over curb design. A similar clash occurred in Philadelphia, where residents of the historic Society Hill neighborhood successfully lobbied for a improved design a few years ago. Rosanne Loesch, former president of the Society Hill Civic Association, said neighbors felt that the initial proposals for the ramps — bright red mats over a swath of light concrete — were too splashy for the neighborhood. The neighbors conveyed their disappointment to various historic groups, and persuaded the city to postpone the work while they worked toward a compromise. “We just made a ruckus basically,” she said in an interview. Like Beacon Hill residents, neighbors there preferred brick ramps. But while the city was generally open to ideas, on this point they would not bend. The city installed tinted concrete and black tactile strips — to aid blind and vision-impaired pedestrians — creating a nice contrast, Loesch said. “The black looks very handsome,” she said. David Perri, Philadelphia’s streets commissioner, said bricks were too slippery and not durable enough. The Beacon Hill Civic Association has sued the city over ramps to help disabled pedestrians. Perri said the city agreed to use “as much brick as possible” around the ramps, a concession that raised the cost about 40 percent. The added expense was worth it, he said, to make the ramps complement their surroundings. In Portland’s historic district, the city chose brick ramps, along with dark gray tactile strips, as opposed to yellow in the rest of the city. “That was a compromise” between disability advocates and preservationists, said Bruce Hyman, the city’s Bicycle & Pedestrian Program Coordinator. In Boston, neighborhood leaders said the city made it clear that concrete was nonnegotiable. The city plans to install 250 ramps — overlaid with the plastic, bumpy strips — on Beacon Hill. But Gilmore said brick is part of the “Boston brand,” and that the city has numerous brick ramps. “Brick is made to last a long time,” Gilmore said. The issue of materials is critical in historic districts, she said. When residents want to make changes to their homes, they must use materials that are compatible with the neighborhood, regardless of cost. John Winske, executive director of the Disability Policy Consortium, which has lobbied the city for improved accessibility, said Beacon Hill’s resistance stood in sharp contrast to other neighborhoods.